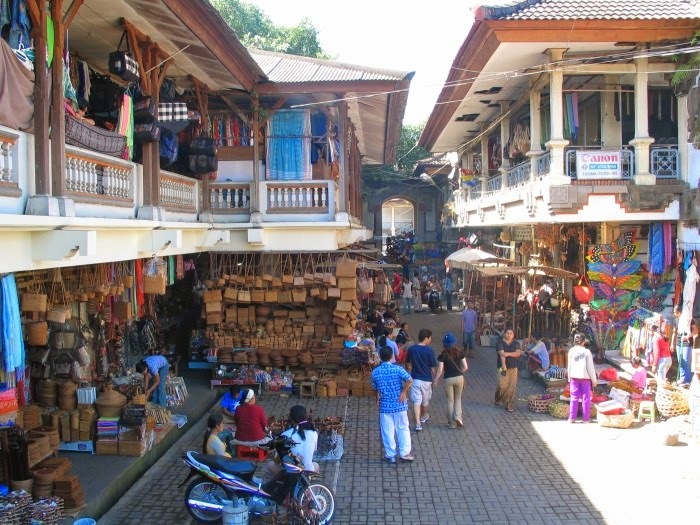 If entering the Ubud Art Market, then it will feel a sense of art that is very high. Not only art souvenirs, merchandise is also sold to residents ritual. On the left side of the market, there is a craft stall matting. Also there are many stalls selling fabrics and a variety of local handicrafts. Entry into the market, there is an open space that is filled by the seller of various kinds of vegetables, fruits, flowers too. Vegetables and fruits in Ubud Art Market is not only to eat, also the interest, not just to be a decoration. Vegetables, fruit, and flowers became one of the ritual paraphernalia by residents of Bali, the majority Hindus. Not far from where the fruit and vegetable sellers, there are sellers offering container made of palm leaves. The price of Rp1,000. for three offerings container, the container is often referred to ceperan. Ceperan used as raw material for making canangsari. Not only ceperan, as well as various means of rituals that are often used by residents. One of the tourist attention in Ubud Art Market is a temple. The temple called Pura Melantiing. Melannting temple is a temple that always exist in a market, where the market was in Bali, certainly has a temple. This temple was built specifically for traders in Ubud Market. Traders worship at the temple every day. Traders pray in the morning and evening. Routine activities of traders in the morning has become an attraction for foreign tourists. Thus, Ubud Art Market into a unique attraction for tourists but natural. The market is not just a place to sell and buy, but also become a tourist attraction that shows the life of the citizens of activity. Traders in Ubud Art Market selling in turns. Morning to evening the pegadang sell in turns. When the morning, in the Ubud Art Market that there are traders of vegetables and cooking purposes. Vegetable traders will sell up before noon. Because it will be replaced with a different type of merchandise by different vendors. From noon until late afternoon, the type of merchandise that is sold will change. During the day, the greengrocer may shift to the merchant souvenirs. Which makes it look unique view of Ubud Market is an umbrella used vegetable and fruit vendors. The seller's use of woven bamboo umbrella of a square, rectangle others.